© 2003-2019 Christ the King Parish. All rights reserved. Please complete a Parish Registration Form, available from the carousel at the back of church and return it to the Presbytery letter box at 9 Crescent Gardens, just around the corner. For more information see our Parish directory. Marriages: You need to give at least 6 months’ notice. Father, pour out your Spirit upon the people of this parish and grant them a new vision of your glory, a new experience of your power, a new faithfulness to your word, and a consecration to your service. The members of the Safeguarding team at Christ the King are Celine Duckworth, David Boyce and Simon Cowdry. Justice & Peace Group – next meeting Mon 29 April 8-9pm at the Old Fields Pub, Replingham Rd, Southfields. All welcome. 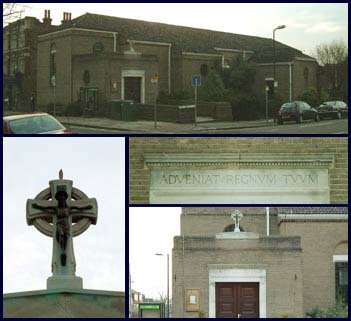 PARISH MISSION – Sat 11 May to Sun 19 May. Confirmation Ceremony – Sat 15 June during 6pm Mass. Music Quiz/Live Music Evening – Sat 22 June – 7pm in the hall. First Holy Communion Ceremony – Sun 30 June during 10.30am Mass. AFTER 10.30 MASS COFFEE MORNING: every Sunday in the hall – all welcome! Help us to undertake your mission in bringing others to you. Let us, by your example, draw them into your loving embrace. - FREE: Our Posters are available for your windows. Please pick one up from the newsletter tables. Our Easter cards listing Holy Week and Easter Masses/Services are also available on the Newsletter tables. Please put them through the letter boxes of neighbours. - Envelopes are available also, on the newsletter tables, for your Easter Offerings. - ‘Day by Day’ booklets for Easter for children – both ‘Junior’ and ‘Infant’ editions are available, free of charge, from the newsletter tables. - Fr Terry will be the CHIEF celebrant on Maundy Thursday, for the Mass of the Lord’s Supper at 8pm. He will need 12 adult feet. Please sign on so that we will not be worrying at the last minute. Next Sunday, Easter Day: Fr Anthony will be going off, after Mass, as he usually does, with HCPT to Lourdes with disabled and special needs children. Please note that, during his absence, Fr Terry will be saying the 9.30am mass on Mon 22 & Tues 23 April. Then there will be no morning masses from Weds 24 to Sat 27 April, instead Holy Communion Services. GLUTEN FREE hosts are available at each Mass in a pyx beside Fr Anthony. AFTER 10.30 MASS COFFEE MORNING: every Sunday in the hall – all welcome! More Volunteers are needed to sign up to serve the drinks – please see sign-up sheet in the hall kitchen. GUIDED PRAYER: Audrey from the Jesuit Team spoke at masses last weekend about this special element of the Mission Week. Please pick up a leaflet from the table at the back of church for more info and return to Joanne in the Office. SERVING REFRESHMENTS during Mission Week: We need people who will kindly serve light refreshments three times a day Monday to Friday during the Mission week. Please see signing up rota on the table at the back of church. CALLING ANY YOUNG PERSON: We want to use Social Media to invite others to come to the Mission. Can you give us advice on how best to do this? Please talk to us. FIRST HOLY COMMUNION 2019: The 18th preparation session, for those enrolled, ‘Jesus’ Resurrection and His Forgiveness of Sins’, will take place AFTER EASTER on Sunday 28 April. A date for your diaries please – the last (4th) Parents’ Meeting will take place on Monday 20 May at 8pm in the Hall. CONFIRMATION: The Fourth Preparation Session for all registered Candidates will take place AFTER EASTER on Thursday 2 May at 8-9pm in the Hall. RED BOXES – MISSIO: a big thank you to all Red Box holders for the £1,694.00 this parish collected in 2018. Missio invites you all to an afternoon of talks, prayer and reflection on Missio at the Sacred Heart Church, Edge Hill (in the Lounge) on Sunday 4 May starting at 2pm and ending with Mass at about 4.30pm. Refreshments will be provided. I hope that you will be able to come along. It would be great to meet my fellow volunteers! If you can attend please contact me, John Pedder, in advance, on 020 8946 4458 or email: john.pedder@yahoo.co.uk. CAN YOU TEACH ENGLISH? Two of our Polish sisters could do with improving their English. They wondered if there was anyone, eg a retired teacher, who might help them? Please let us know.